Ear tubes are tiny, hollow cylinders, often made of plastic or metal, that are surgically placed in the eardrum. This tube creates a hole that allows air to get into the middle ear and stops the collection of fluid behind the ear drum. I have already shared valuable information addressing ear infection myths, important ear infection fact﻿﻿﻿﻿﻿s, tips to prevent ear infections and 4 of the big, scary complications of ear infections! But, I continue to be faced with ongoing ear infection questions. Many different ear tubes exist. The color of the tube has no significance on the tube function. Designers create lots of new tubes with fancy features such as antibiotics made into the plastic, a filter in the center of the tube and slowly dissolving ear tubes. These gimmicks do not significantly change the end result of the ear tubes. The tubes simply provide drainage.All tubes are designed to be a short term solution. The tubes fall out on their own or need to be removed. They typically last from 6 months to several years, depending upon which tube is used. In my practice, 80% of patients under age 3 outgrow their problems, and I don’t see them again after tubes are gone.The other 20%… well they fill my practice, and we become besties! These children usually have some other problem (in the nose) which continues to impact the eustachian tube. The above statement is a special Dr. Momma phrase! I say this every single day to my patients, so feel free to use it as needed! The basic meaning is that you must control symptoms in the nose if you want long-term control over ear infections.Young babies seem to have colds all the time. A recent article in the December 2016 issue of the Pediatric Infectious Disease Journal described what I see in my patients. Toddlers under age two commonly had cold symptoms for 44 days; however, some kids had symptoms for 100 days each year!This huge number of viral infections explains why that drippy nose frequently causes ear infections in young kids. However, these large numbers do not continue for your 3, 4 and 5-year-old kids. Something else is probably happening. These are my long-term patients!Children undergo ear tube surgery for a variety of reasons. 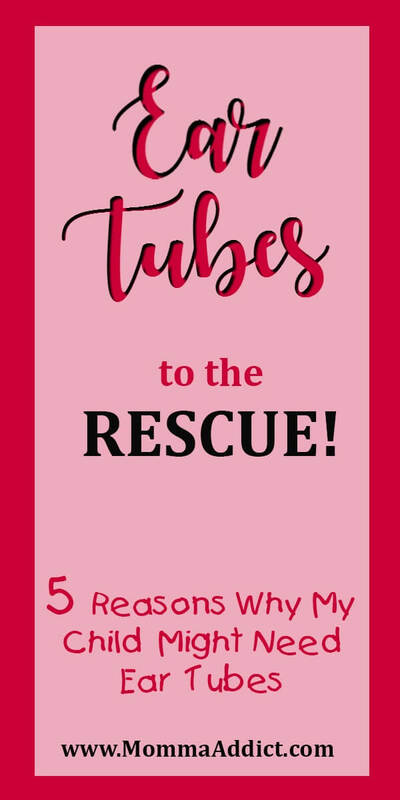 One mom writes about her experience with all four children needing tubes. Usually parents and their pediatrician agree that the child has been seen and treated for too many infections.A consultation to the Ear, Nose and Throat (ENT) physician is then made. Every patient referred to ENT does NOT need tubes. An accurate history provides the most valuable information. Please do not forget the lessons learned about what is needed during a consultation with a physician specialist!Generally speaking, the number of ear infections or length of time that ear fluid stays behind the ear drum are the two main indications for ear tube placement.But….medicine is not an exact science! Your child may have these indications and end up not needing tubes or your child may not be as severe as the indications listed, but still would benefit from the tubes. These are the rare complications which require urgent ear tube insertion. If the infection become trapped in the bone surrounding the middle ear, a risk for meningitis, brain abscess or permanent hearing loss may result. Immediate surgical drainage to relieve the pressure is indicated.This blog has been written to address the common question: Should my child get ear tubes. The answer is not simple but hopefully this post serves as a guide. Additional blogs will be forthcoming to address ear tube myths, important facts about ear tubes and of course, complications of ear tubes!